The above info came from jonathan gruber, and was edited by yours truly (contact me). The image came from filmsy.com. 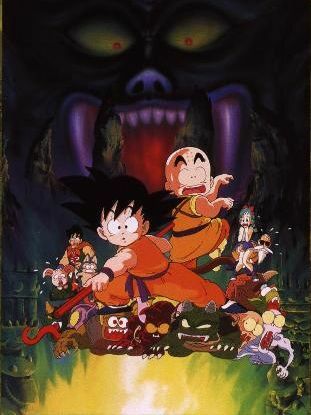 Dragon Ball: Sleeping Princess in Devil's Castle is the second Dragon Ball movie. Master Roshi has Goku and Krillin find a princess that is sleeping in a castle located near a place called The Devil's hand. This is a test for Goku and Krillin so Master Roshi can accept them as students. While Goku and Krillin try to find the princess, a woman named Launch (who has a two-sided personality) is also after the sleeping princess. Also, Bulma finds out that Lucifer is going to use the sleeping princess to destroy the sun. During the movie, three of the five fingers of the devil's hand get destroyed, and Goku's tail gets cut off. For those of you who aren't familiar with Dragonball, something happens to Goku when the moon is full. When Goku sees the full moon, and he does in the movie, he turns into a giant monkey-like creature. The only weakness is his tail, and the only way to change Goku back is by cutting his tail off. After the tail gets cut off, Goku wakes up in his birthday suit because during the transformation, his clothes get ripped. The above description came from jonathan gruber, and was edited by yours truly (contact me).